CreativeMornings is an international series of monthly talks dedicated to creativity and its community. There are currently chapters in 164 cities—in 2011, it came to Chicago, “My Kind of Town.” And CreativeMornings is my kind of design conference: local, no-frills and grounded. What I find in CreativeMornings is the same renewable source of vitality that drives my passion project of Design Feast: creative culture. Having started in January, designer and Chicagoan Jen Marquez is the new organizer of the CreativeMornings/Chicago chapter. She wrote an op-ed piece for the blog of Agency EA, this year’s partner involved in helping to move the CreativeMornings/Chicago chapter forward. Being an observer of breakfast lecture series CreativeMornings (explore my 65+ write-ups, particularly on the Chicago chapter), I was positively provoked by what Jen shared, and felt that there were opportunities to further clarify and spread the wealth of support that CreativeMornings, specifically its Chicago chapter, attracts. Since 2013, the CreativeMornings/Chicago chapter has evolved dramatically under the direction of Kim Knoll and Kyle Eertmoed, who comprise graphic design studio Knoed Creative. They helped forge what the chapter needed desperately: Infrastructure. Their efforts improved the chapter from the inside out. Have consistent monthly gatherings?—Done. Film and archive each event?—Done. Advance an inherited Web-based toolkit to facilitate and govern the flow of chapter-organizing information? Done. Another change that was particularly welcome: Far more women speakers. Before Knoed Creative’s management of the CreativeMornings/Chicago chapter, there only were two female speakers—Kim then Sara Frisk, who also spoke in 2012 when she was a Communication Design Lead at IDEO (read my write-up). Jen too is visibly advancing this pattern—boosted by the mindful efforts of Kim and Kyle. Systems thinking and execution can be a gift that keeps giving. CreativeMornings/Chicago chapter attendees, plus future hosts and organizers, have Kim and Kyle to thank for how smooth and connected the CreativeMornings/Chicago chapter is, turning it into a system that benefits everyone. The chapter’s quality and stature is primarily due to their four years of proactive and steadfast attention to detail. A friend of mine said, “Some organizers are more organized than others.” Kim and Kyle have demonstrated themselves as the more organized organizers. And the landscape of creative disciplines unfolds furthermore on a monthly basis, via the CreativeMornings vehicle. A multidisciplinary serving of viewpoints, matched by a body of work, with creativity a strong current circulating throughout. An advantage of CreativeMornings’ appeal is that there’s no admission fee. The common, even siloed, perception of “free” remains with this definition—this one metric. Yet, “free” exceeds the absence of ticket price. It largely testifies to the fact that each CreativeMornings/Chicago meetup is only achieved through an orchestrated range of actions, in essence: Raw human power (as I put it in this past write-up). Making a monthly series of events, year after year, consumes much time and energy when you take the ideation, planning, managing, physicality—and slew of micro-actions in between, into account. It’s a work-out! Yet the noble efforts are not apparent to a number of attendees. Rare as it is, whenever I encounter someone who complains about CreativeMornings, I point them to the fact that it’s volunteer-driven. If they fail to find this fact profound, even motivational, they may, I strongly suspect, be reminded comfortably that it’s “free” for their potential to ultimately feel soothed, inspired and more. Without a dedicated team, there would be no CreativeMornings chapter—anywhere. To the Chicago chapter, I offered thanks to its volunteers. The hosts and partners get the majority of the spotlight, but there are adjacent people who play a part and command it at each event, parts such as photographers, videographers, guides, producers, communicators, moderators, the list of players goes on. These volunteers deserve regular recognition beyond a chapter’s gatherings. Thanks must be also stretched to people who socialize it through media platforms, particularly those who socialize it through writing. CreativeMornings is a universe for connecting thoughts, whether they’re light as notions or heavy as convictions. It’s an environment optimized for writing. My chief motivation for appreciating CreativeMornings is the excitement (rather than the embarrassment) of riches, presented via speakers generously sharing the enthusiasm of doing what they do, chance chats and observations—the total experience preceding, during and after the event ends. Expert user researcher Steve Portigal’s practice of “noticing power” is enabled at each CreativeMornings event. All ingredients for writing, all inputs to write. And writing one’s heart out about CreativeMornings matches the quality of the teams’—completely voluntary. If you write about CreativeMornings in your city, let me know. 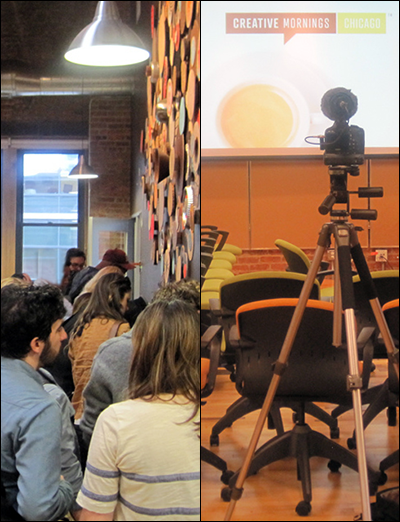 Thankful to be called “a roving reporter on CreativeMornings.” Explore my write-ups ← 65+ and growing. Faced with the constant change of climate—politically, socially, physically, CreativeMornings is a coping mechanism, whether it’s in-person or remote, with the benefit of long-range empowerment.